Sounds like Acer is getting into the tablet game!. With the holidays too close for comfort, the outfit's giving everyone pause that was considering that janky Android tablet on sale for Black Friday. 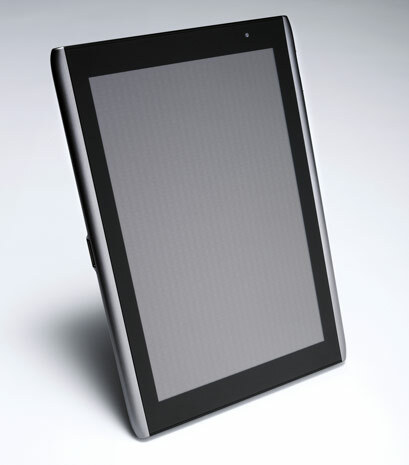 The tablet will also feature a Gyroscope for gaming. All jesting aside, the flagship 10.1-incher looks quite interesting, boasting a dual-core 1GHz processor, an HDMI output and a native 1280x800 (!) screen resolution. You'll also get a 5 megapixel rear camera, an "HD" front-facing camera for video calling and full multitouch support. Hard to say how many clams it'll cost ya, but at least there's an April 2011 ship date to mark down. Moving on, the 7-inch tablet (also unnamed as of now) packs the same screen resolution, a dual-core 1.2GHz Qualcomm CPU and the same Flash 10.1 support -- so far as we can tell, the "Android Tablet OS" Acer speaks of is Froyo, or Android 2.2. As for the price, nothing has been confirmed, but this Acer tablet should be shipping in April 2011, and you can bet we'll be scrounging up more details as soon as we can. Oh ya, sudah saya link back sob, thanks ya. Thanks ya sob link backnya. Sukses selalu.